It goes without saying that Deal Pier Kitchen’s main appeals is the location and views surrounding it. The new benches and resurfacing have been completed in time to welcome new visitors who haven't ventured down the pier for a while. We came in at 3 on a Thursday to try and catch a time when the hype had died down, that proved to be harder than expected. As it was still basically full on a weekday afternoon. We managed to nab a spare table. We were greeted with such friendliness and hospitality. We were lucky with our choice of day, the winter sun streamed through the windows. Although at times a little dazzling, it made the sea glitter and turned the sky all shades of blue and pink. The view of the town standing to attention on the seafront and the endless sea in the other direction. There is a sensation that we’re at sea, surrounded by the waves. Every table in the place gets a great view, because of the large windows. You can get your Swedish Bun fix during the week as Bygga Bo supplies her delicious baked goods. We’re loving how Bygga Bo expanding her reach beyond the market, and it’s always great to have more places to eat the buns. There are lots of other goodies to chose from underneath the big glass domes. The decor is fresh and bright, nothing too fussy. A heavy-handed touch would detract from the view. 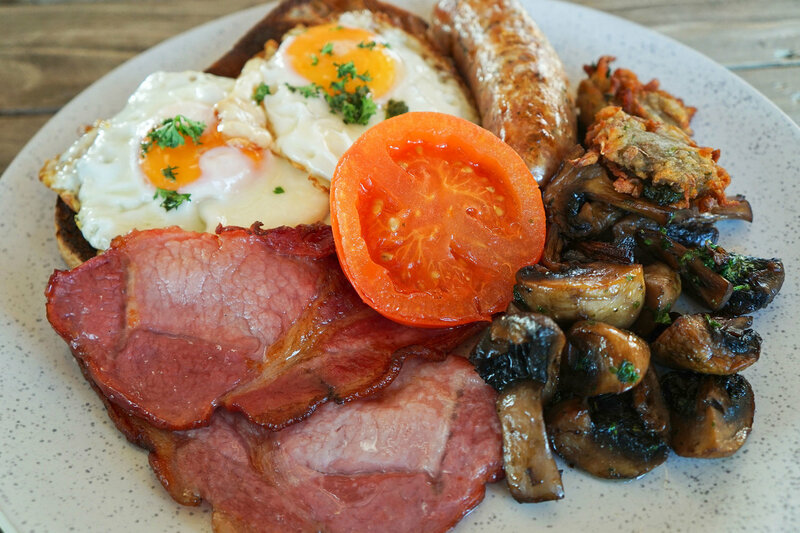 The breakfast booze option is a great idea for levelling up a brunch with friends. Storage crates of alcohol are suspended from the ceiling, making for an impactful feature. Turquoise glossy tiles adorn the serving area and entrance while miniature pots of cacti sit on the larger tables. First, we shared a breakfast crumble. 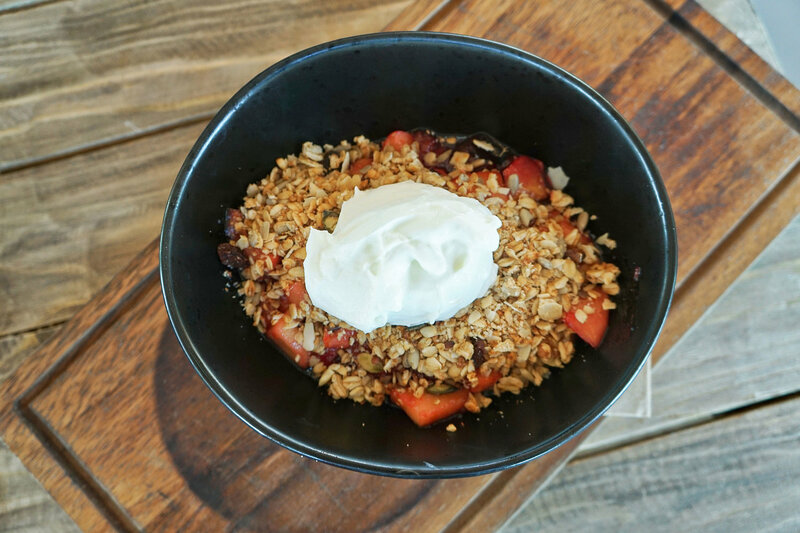 Spiced and stewed fruit, toasted granola topping served with yoghurt. The blanket of granola covered the extent of the fruit and a scoop of yoghurt sat on top. On first inspection, it looked like it would be quite a dry dish, but it was perfectly balanced by the fruit and yoghurt. The stewed fruit was sweet and warming, paired with a nutty oaty topping. We wouldn't normally come out for breakfast and choose granola, but it’s worth coming to try this alone. A really cosy dish to enjoy on a winters day. It’s a relatively health-conscious menu, with plenty of veggie options. 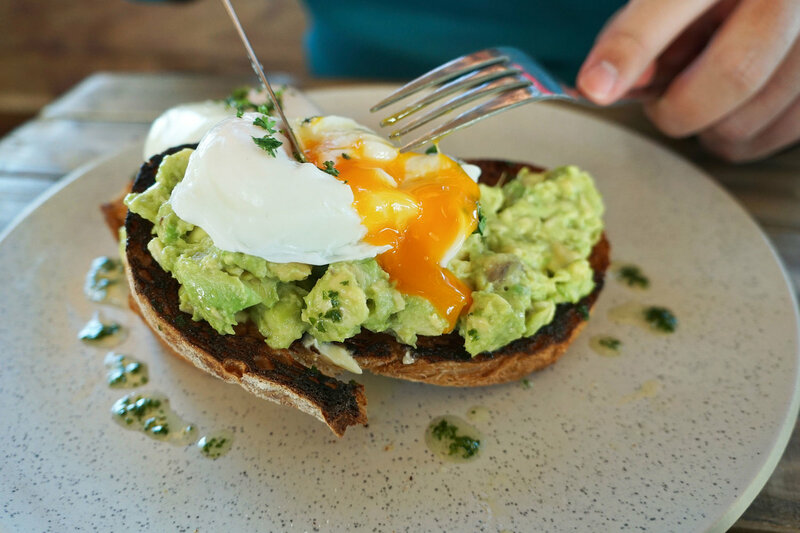 Sourdough is a big player, it turns up in the DPK Breakfast and the avocado and eggs dish we order. It’s delicious and served well making it easy to handle. Toasted on one side and buttered, there are no shards of brittle bread to negotiate. Topped with beautifully creamy avocado and perfectly poached eggs. 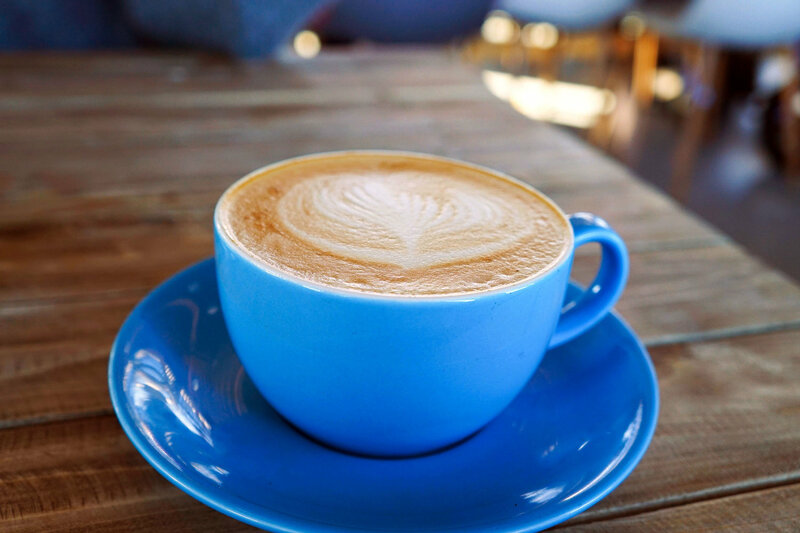 Perfect for getting your day off to a good start. Leaves you satisfied but doesn't send you into a food coma. Onto the DPK Breakfast. Apt that they have put their name to it, as it seems to be the star player on the menu. Each component is really well done. 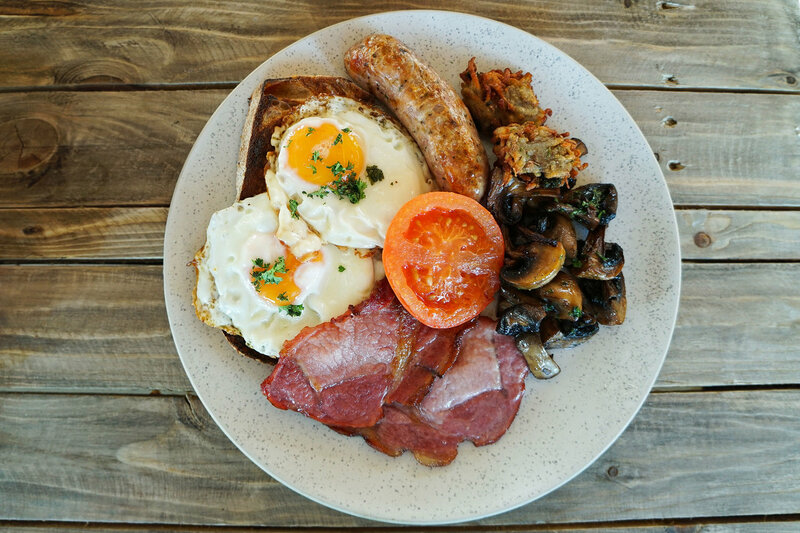 The “Old English Sausage” is our favourite and one of the best we’ve had in a long time. Herby and meaty, everyone has their own ideas about their perfect sausage but you’d be hard pressed to find something wrong with this offering. The DPK team even posted about their sausage tasting on Instagram while preparing their menu.The mushrooms also stood out as a great item, robust and well cooked. The Bacon was great quality, succulent thick and a great deep pink colour. The hash browns were a little smaller than you might expect (especially if you chose to add them on as a side for £2), but we couldn't fault the punchy flavour. The whole plate was pretty grease free for a fry up, we were sad to see the end of it. If the food wasn't up to a standard it would show. With such an excellent location, there's no place to hide. The service was friendly, and the menu fresh and vibrant. When the weather gets warmer and the pier is open for longer, DPK will have a chance to really spread its wings and shine. For now, grab a table for brunch sit back and enjoy the view.